Tagline The story of a boy suddenly alone in the world. The men who challenge him. And the girl who helps him become a man. 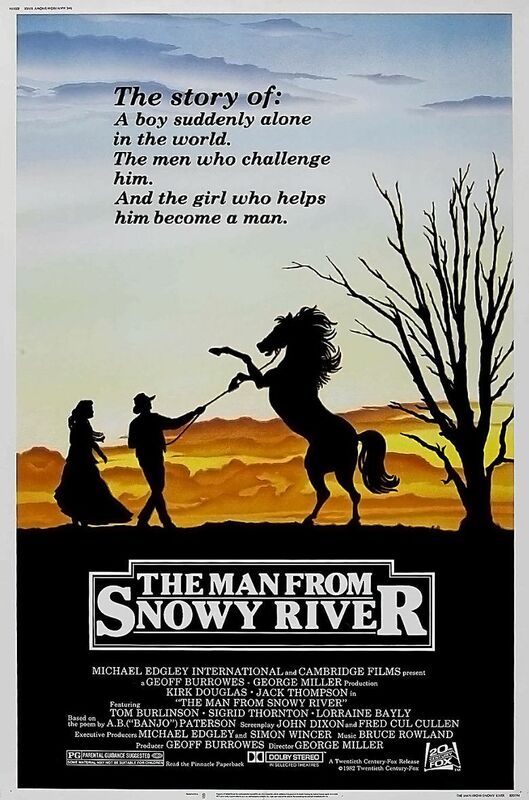 The Man from Snowy River is a 1982 Australian drama film based on the Banjo Paterson poem "The Man from Snowy River". The film had a cast including Kirk Douglas in a dual role as the brothers Harrison (a character who appeared frequently in Paterson's poems) and Spur, Jack Thompson as Clancy, Tom Burlinson as Jim Craig, Sigrid Thornton as Harrison's daughter Jessica, Terence Donovan as Jim's father Henry Craig, and Chris Haywood as Curly. Jim meets an old friend called Spur, a one-legged miner. Jim then gets a job on a station owned by Harrison, Spur's brother, on a recommendation by Harrison's friend. Meanwhile, Clancy appears at Spur's mine and the two discuss their pasts and futures. Clancy goes to Harrison's station to lead a cattle muster. At dinner, Harrison tells Clancy that "he has no brother" when referring to Spur. Harrison organizes a round-up of his cattle, but Jim is not allowed to go. While the others are gone, Harrison's daughter Jessica asks Jim to help her break in a prize colt. The mob appears again, and Jim unsuccessfully gives chase to the valuable horse. When Harrison returns, he sends Jim to bring back 20 strays. Later, Harrison learns of Jim's actions and tells Jessica that Jim will be fired and that she will be sent to a women's college. Impulsively, she rides off into the mountains where she is caught in a storm. Spur, meanwhile, finally strikes a large gold deposit. Jim finds Jessica's horse and rescues her. She tells him that he's going to be fired, but he still leaves to return the cattle. Jessica is surprised at meeting Spur, her uncle, whom she had never been told about. She is also confused when Spur mistakes her for her dead mother and refuses to tell her anything about his past. After returning, Jessica learns that Spur and Harrison both fell in love with her mother, Matilda. Matilda declared that the first to make his fortune would be her husband. Spur went looking for gold, while Harrison bet his life savings on a horse race. Harrison became rich overnight when the horse he bet on won. Having made his fortune, Harrison wed Matilda, but she died while delivering Jessica. Harrison is grateful to Jim for returning his daughter, but he becomes angry when Jim says he loves her. As Jim leaves, a prized colt is let loose by a farmhand in the hope that Jim will be blamed. Later, while camping out, Spur tells Jim that he will inherit his father's share of the mine. Clancy joins them and informs them of the colt, but Jim refuses to retrieve the animal. Meanwhile, Harrison offers a reward of ₤100, attracting riders and fortune-hunters from every station in the area. Clancy does eventually show, accompanied by Jim, whom Harrison finally allows to join the hunt. Several riders have accidents in pursuit and even Clancy is unable to contain the Brumby mob. The riders give up when the mob descends a seemingly impassable grade. However, Jim goes forward and returns the horses to Harrison's farm. Harrison offers him the reward but he refuses. Having cleared his name, Jim would like to return some day for the horses and, looking at Jessica, "anything else that's mine." He rides back up to the mountain country, knowing that he has earned his right to live there. According to Geoff Burrowes, the idea to make the film came at a dinner party when someone suggested the poem would make a good movie. Burrowes developed a treatment with George Miller then hired John Dixon to write a screenplay. All three men had worked together in television; another former TV colleague, Simon Wincer, became involved as executive producer with Michael Edgley and succeeded in raising the budget. 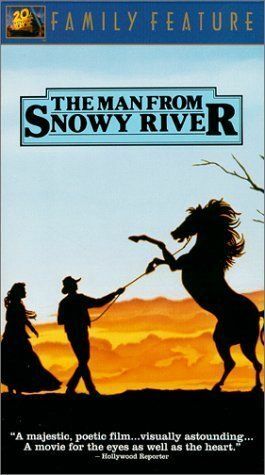 The screenplay contains numerous references to Banjo Paterson, aside from using his poem "The Man from Snowy River" as the source material and his inclusion as a character in the film. For example, the numerous references to the late Matilda are likely a reference to the song "Waltzing Matilda", which was written by Paterson. In addition, the melody for "Waltzing Matilda" can be heard near the end of the film. A Bible Passage from Genesis 30:27, which talks about cattle, goats, and sheep is read aloud in a scene in the middle of the film. Burt Lancaster and Robert Mitchum were considered for the dual role of Harrison and Spur before Kirk Douglas was cast in the roles. The movie was not shot in the actual Snowy Mountains but in the Victorian High Country near Mansfield, Victoria, where Burrowes' wife's family had lived for several generations, which was logistically easier. 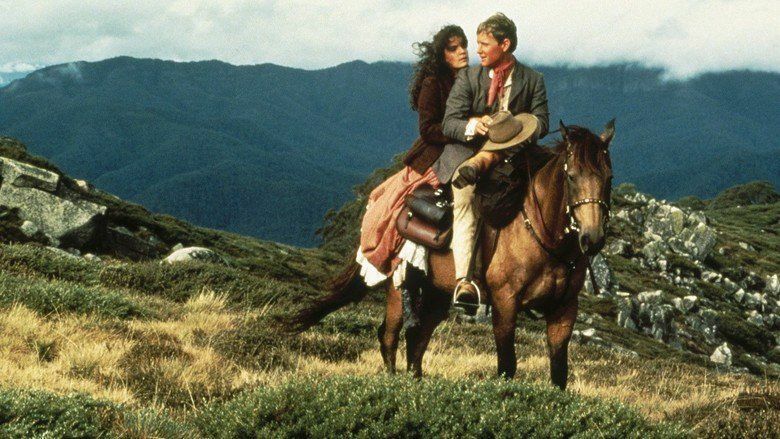 Tom Burlinson has confirmed that it was definitely him who rode the horse over the side of the mountain for the "terrible descent" during the dangerous ride—commenting that he had been asked about this numerous times, and that he became known as "The Man from Snowy River" because of his ride. 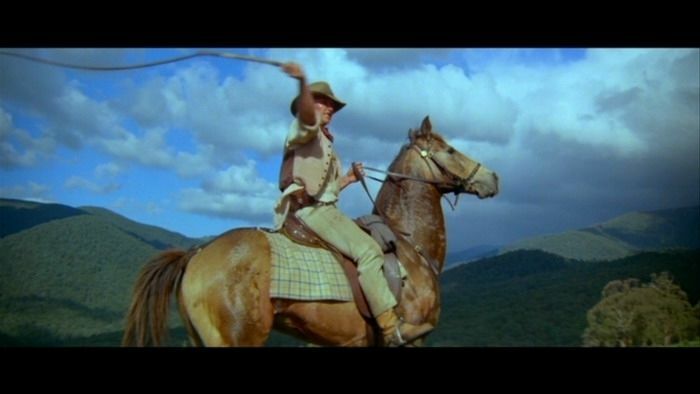 Remarkably, Burlinson had never ridden a horse before being cast in the film and the "terrible descent" was a one-take shot at full gallop down the cliff face. Burlinson performed all of his own stunts in the film. The Craigs' Hut building was a permanent fixture created for the film. Located in Clear Hills, east of Mount Stirling, Victoria, the popular 4WD and hiking landmark was destroyed on 11 December 2006 in bushfires. The hut has since been rebuilt. The film was selected for preservation as part of the National Film and Sound Archive of Australia's Kodak/Atlab Cinema Collection Restoration Project. The film "was released to a fair degree of critical acclaim" and "moviegoers found it to be a likable and highly entertaining piece of filmmaking that made no effort to hide its Australian roots, despite the presence of American star Kirk Douglas in one of the principal roles." The film has a rating of 80% on film review aggregator Rotten Tomatoes. Kirk Douglas later sued Burrowes for a share of the profits. Bruce Rowland composed the music for the film. He also composed the music for the sequel. 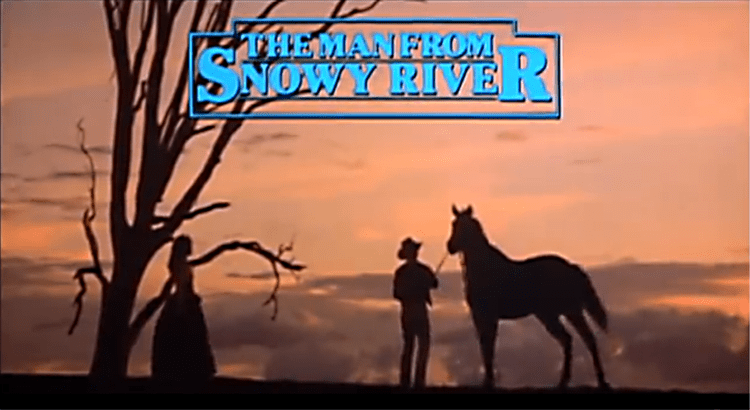 2000 Summer Olympics—Bruce Rowland composed a special Olympics version of The Man from Snowy River "Main Title" for the Olympic Games, which were held in Sydney. The CD of the music for the Sydney Olympics includes the Bruce Rowland's special Olympic version of the main title. Bruce Rowland composed special arrangements of some of the film soundtrack music for the 2002 musical version of The Man from Snowy River, The Man from Snowy River: Arena Spectacular. 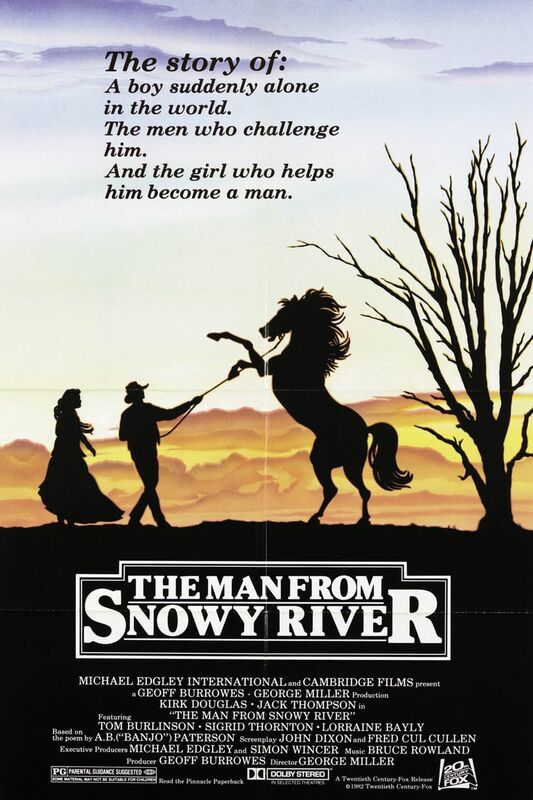 The Man from Snowy River grossed $17,228,160 at the box office in Australia. 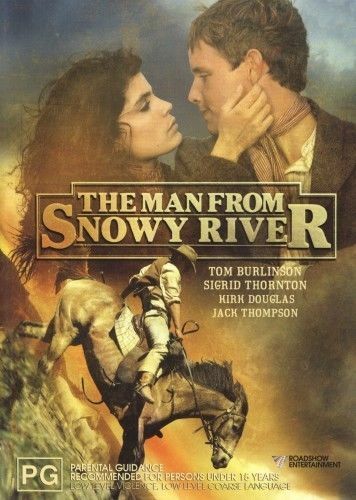 As indicated by its box office takings, The Man from Snowy River gained a very large audience, popularizing the story and Banjo Paterson's poem. 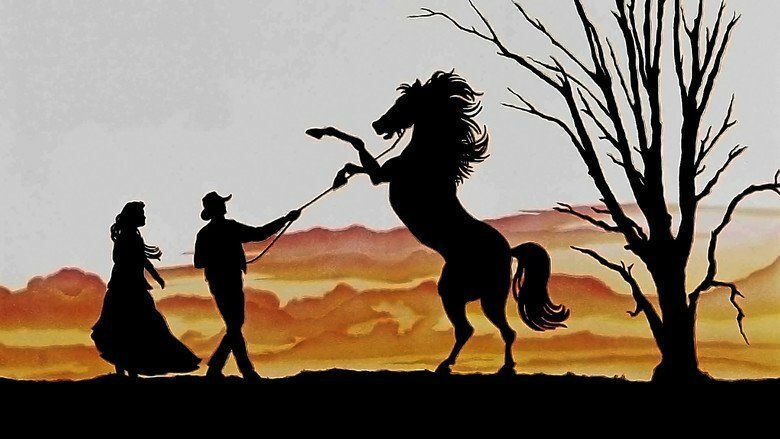 Since 1995 the story has been re-enacted at The Man From Snowy River Bush Festival in Corryong, Victoria. Jack Thompson who played Clancy in the film has released recordings of a number of Banjo Paterson poems including Clancy of the Overflow and The Man from Snowy River on the album The Bush Poems of A.B. (Banjo) Paterson.